We run a number of specialised activities during holiday periods, and on Fridays during school time. These include Gardening, Sound Camp, Drama, Train Trips, Tennis and many more. Up to 30 children have recently enjoyed the Basically Useful ‘Skills for Life’ Programme. teaching practical life skills giving independence and confidence. 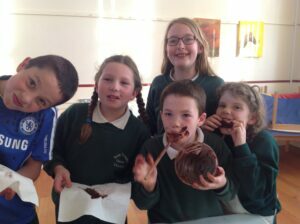 Children learn to cook a variety of meals, develop sewing skills, create invitations, learn and practise communication skills and host a party for parents on the final evening where students receive certificates. Gardening is a popular activity coming into the Summer months as children plant and sow flowers and vegetables. Summer camps for 2018 include sports activities and day trips – contact Josephine on 061383884 to find out more.